Mammut Alvra Light IN Hooded Jacket. Hold your own every day: the Alvra Light IN Hooded Jacket Men stands out with its highly water- and wind-repellent Pertex® Quantum Pro material for lasting comfort in extreme conditions. Wind and weather will no longer be able to touch you in this jacket. The goose down and feather filling keeps you warm on cold days. You can tuck your hands into the side pockets, while the detachable hood provides protection if necessary. 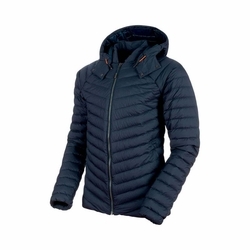 The Alvra Light IN Hooded Jacket Men is a Mammut® Easy Combine product. This means that you can combine it with a host of other products so that you are ready to face any weather.